How can you make a delicious risotto even more delicious? Make the leftovers into arancini. Arancini are delicious fried balls of risotto, often stuffed with cheese and served with tomato sauce. I made them tonight with a delicata squash risotto that I took to the Thanksgiving dinner that my husband I attended. I stuffed them with crumbled blue cheese and hazelnuts and served them alongside cedar-planked salmon and roasted broccoli. A fabulous way to use leftover risotto. Serve as a side or with a green salad for lunch or a light dinner. 2 cups leftover risotto I used delicata and apple risotto, but this works well with mushroom risotto, risotto milanase, or any vegetable risotto. 1-2 oz cheese I used Maytag blue cheese combined with some toasted hazelnuts, since those were the toppings for the delicata squash risotto, but mozzarella or fontina work especially well. 1 egg beaten and seasoned with salt and pepper. 1 1/2 cups breadcrumbs I like to use a combination of traditional homemade breadcrumbs and panko breadcrumbs. Form leftover risotto into balls ~2 inches in diameter. When forming balls, place a small piece of cheese into the center of the ball. Refrigerate risotto balls for at least 30 minutes prior to cooking. 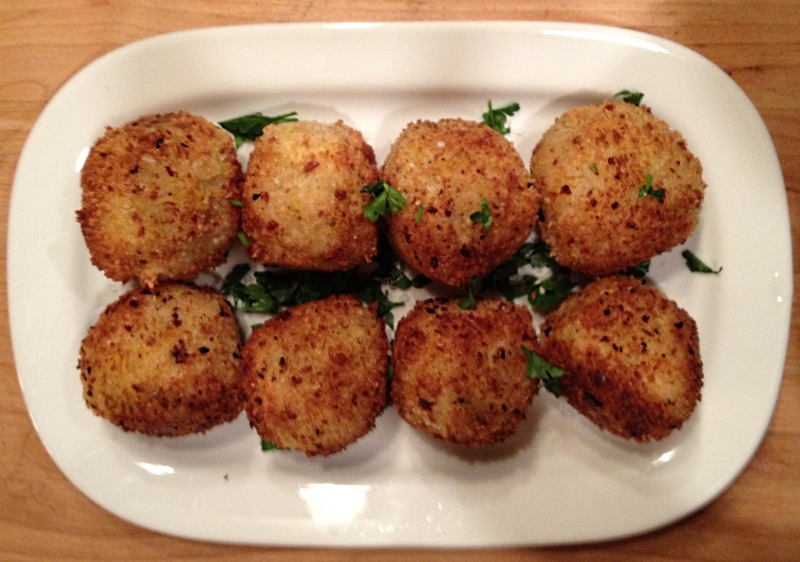 When you are ready to cook the arancini, place breadcrumbs on a large plate and season with salt and pepper. Dip arancini into egg, and then roll in breadcrumbs to coat. Heat oil in a cast iron skillet or frying pan on medium heat until a breadcrumb dropped into the oil immediately floats to the surface. Fry arancini, turning to cook all sides until heated through and golden brown, ~3 minutes.